E3 is is just finishing off and that means there's a lot of crazy gaming gear to look over! From Microsoft’s latest Xbox to a tiny Atari 2600, here’s the coolest stuff we saw this week. 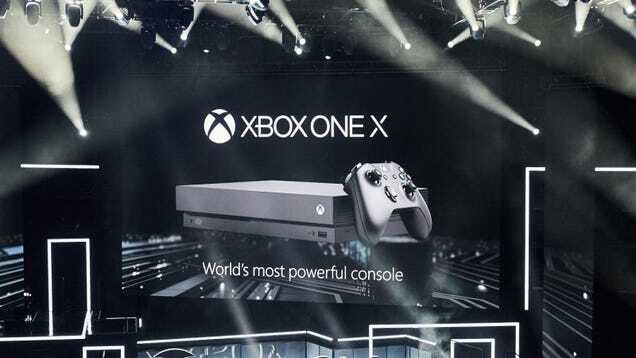 The name reveals someone’s love of the letter X, but the console itself is pretty cool. Six months after Sony launched its 4K UHD console, Microsoft is back with its own. It’s only a minor upgrade on last year’s Xbox One S, but the ability to upscale older games to 4K, or give 1080p TV owners lusher looking effects, might actually make this thing worth it (WE’LL SEE!). At £450, it’s twice the price of the Xbox One S, Microsoft’s current low end Xbox One, but PC gamers regularly pay a lot more to upgrade to 4K, so perhaps it’s not that crazy a price. The 30 games Nintendo packed into the NES Classic Edition don’t seem as impressive when the new Atari Flashback 8 Gold console from AtGames comes with 120 classic Atari 2600 titles, including iconic games like Pitfall!, Space Invaders, River Raid, Centipede, Kaboom!, and Millipede. 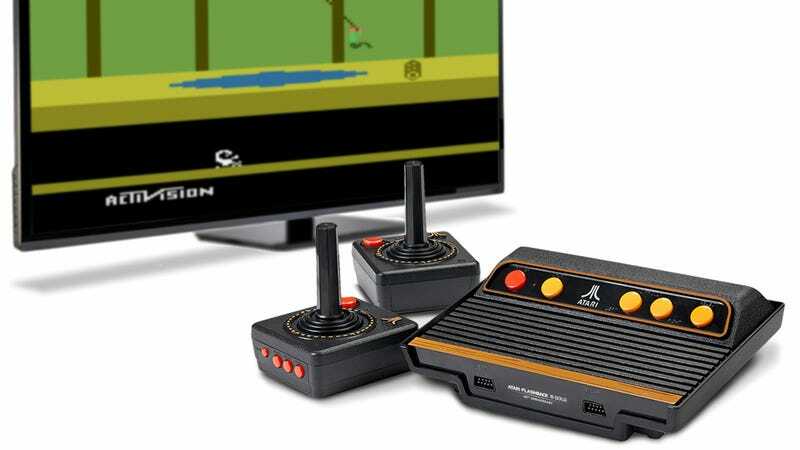 Available come September, the Atari Flashback 8 Gold is essentially a crash course in the history of video games, and includes a pair of wireless joysticks, 720P HDMI output, and the ability to save, pause, or rewind any game you’re playing. 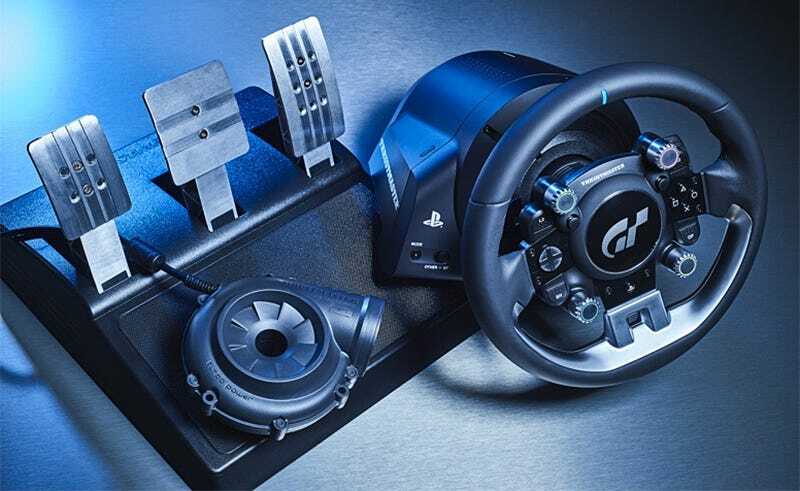 As spotted by Kotaku, one of the most expensive gaming accessories revealed at E3 this year has to be Thrustmaster’s new T-GT racing wheel and pedals, designed to add even more realism to Grand Turismo Sport when it hits the PS4 this autumn. 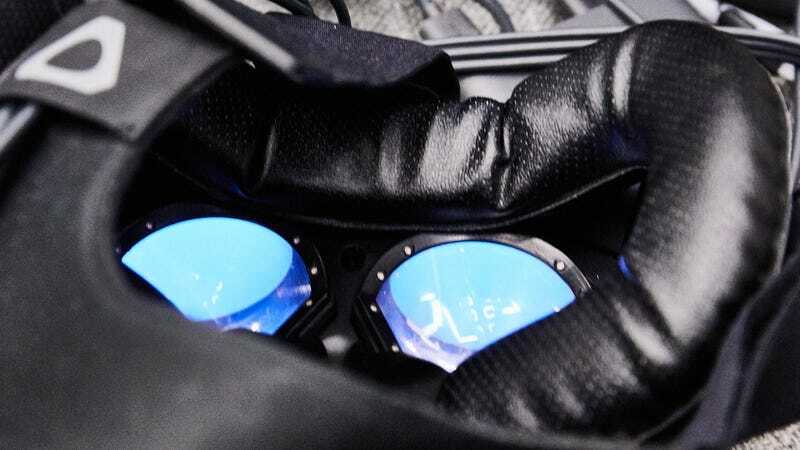 Price at $800 ( £627), the set includes three pedals, the racing-inspired wheel with improved force feedback and wheel position detection, as well as a power supply that looks like a turbo charger torn out of an engine. Vroom, vroom! While today’s kids feud over the superiority of the Xbox versus the PlayStation, a generation ago it was Nintendo versus Sega. 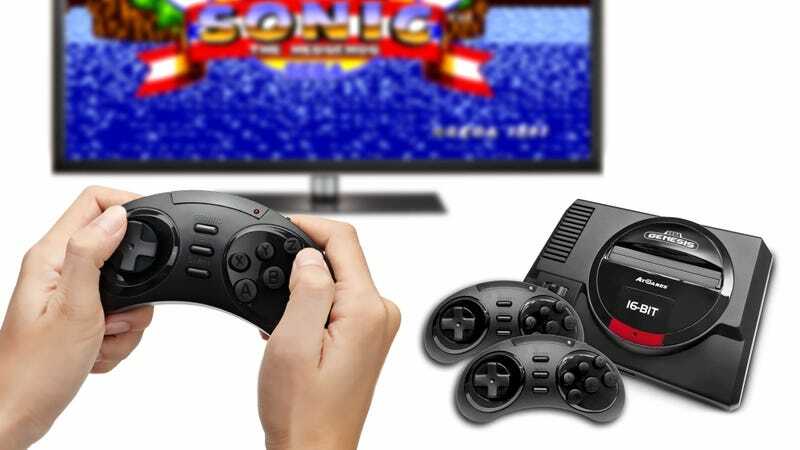 And those who swore allegiance to team Sonic, who’ve been envious of Nintendo’s NES Classic Edition, can finally get their retro Sega fix with AtGames new Sega Genesis Flashback console. Not only does it come with 85 built-in titles including the Sonic the Hedgehog series, the Mortal Kombat series, and the Phantasy Star series, the console also has a working slot for Genesis and Mega Drive carts. Available come September, it also has 720P video output via an HDMI cable, and includes a pair of wireless Genesis controllers. Nintendo knows it has a massive hit on its hands with Zelda: Breath of the Wild, which could very well be the game of the year. So not only does the company have two downloadable expansion packs enroute, The Master Trials and The Champions Ballad, it will also be releasing four new amiibo figures featuring those champions which includes Mipha the Zora, Daruk the Goron, Revali the Rito, and Urbosa the Gerudo. There’s no word on what additional content these amiibo will unlock in the game, but expect them to be available sometime closer to the holidays later this year when The Champions Ballad is officially released. VR wasn’t centre stage at E3 this year, but that didn’t stop it from being part of one of the coolest demos of the show, a completely wire-free HTC Vive headset. 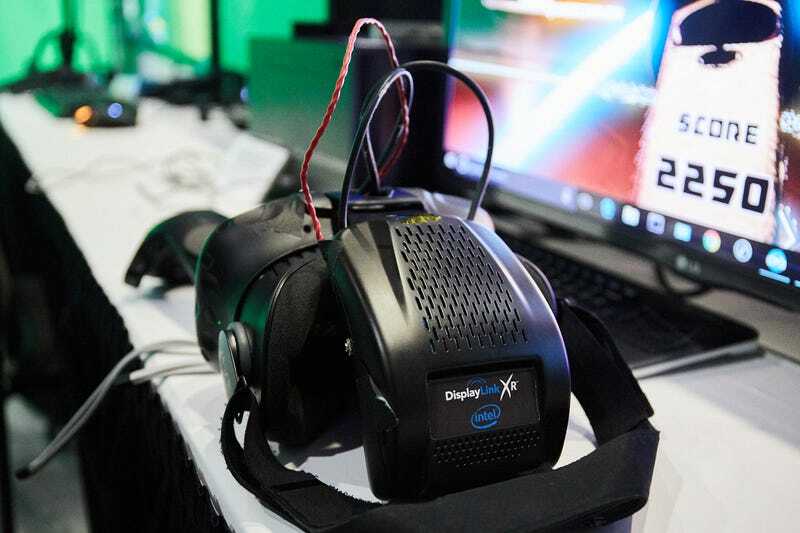 The hacked together prototype headset by Intel (with a big assist for DisplayLink and HTC) uses 802.11ad wi-fi to deliver a wireless VR experience with almost zero lag. Virtual reality has a long way to go before it’s in everyone’s hands, but this gives us all a glimpse of a welcome wire-free future. Razer has always made a decent, affordable, headset, but the Thresher is its first foray into the premium space and it sounds so good you might be able to stomach the price tag. It comes in two versions, a blue one intended for PS4 owners, and a green one meant for Xbox One users. Both wireless headsets work with a PC with the mere flip of a switch. 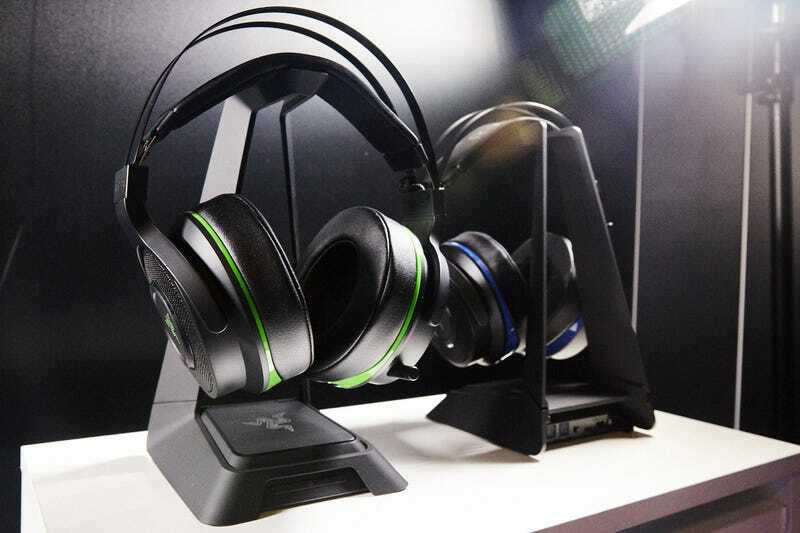 While the headset is wireless, you still need to plug the base station into your game console, normally that would mean another ugly box crammed in the home entertainment centre, but Razer wisely has the box double as a holder for your headset when not in use. VR seems cool until you realize you’re walking around with two giant screens strapped to your face. Then you start to notice just how little you can actually interact with your virtual world. Tobii is attempting to fix that problem by implementing it’s eye tracking technology in a prototype headset based on an HTC Vive. Small white dots around the lenses of in the headset track the wearer’s eye movement, providing an experience far more like the real world, where you can make eye contact with other characters or even just glance around your environment and now feel like you’re standing a foot away from a 75-inch TV. Well before Nintendo stuffed a bunch of classic games into its NES Classic Edition, Hyperkin’s RetroN line has been making it easy for players to enjoy their old game cartridges on modern TVs. 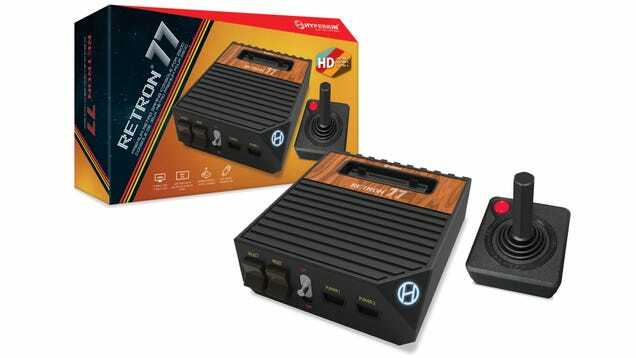 That now extends to the Atari 2600 with the RetroN 77 which can upscale antique Atari carts to glorious 1080P. It also comes with a reproduction of the original Atari joystick controller, the option to actually save your progress on games, and a glorious faux wood panelling finish. Do you like your gaming hardware to be as big as Texas? Good news! 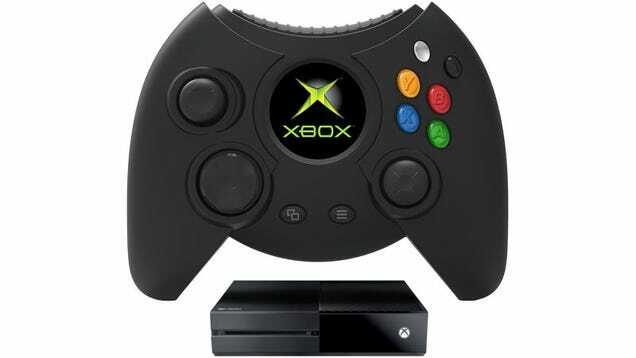 Accessory-maker Hyperkin has worked with Microsoft to put the original Xbox’s gigantic controllers back in your hands. The Duke is an updated version of that oft-mocked controller that now boasts an LCD display smack dab in the centre so you can game like it’s 2001 all over again. As long as you don’t intend to connect it to a TV at a friend’s house, or in a hotel room, the Nintendo Switch is one of the best portable gaming systems to date. But its giant, cumbersome dock is the only way to connect an HDMI cable for the Switch’s TV-out functionality. 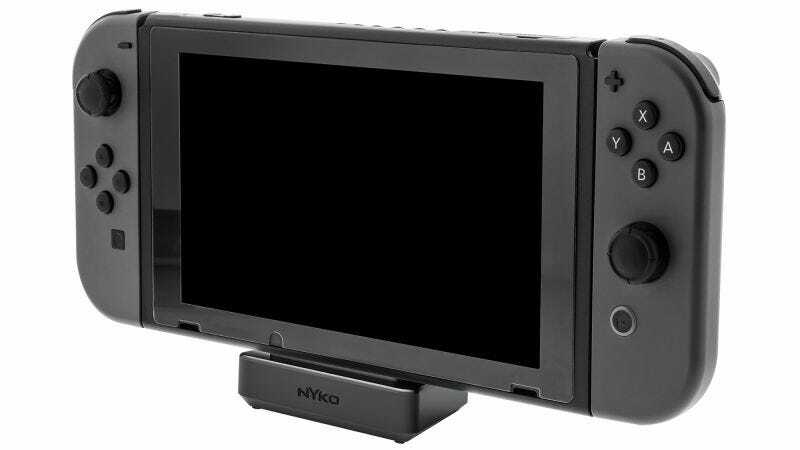 Nyko is the first to market with an alternative: a compact $45 ( £35) Portable Docking Kit that adds charging and HDMI connectivity, but sacrifices the additional USB ports found on Nintendo’s bundled dock. A minor trade-off for improved portability. With a 4,130 mAh battery packed inside, the Nintendo Switch can run for three or four hours, depending on the game you’re playing. That’s enough to pass the time on a cross-country flight, but not if you’re heading to Europe. 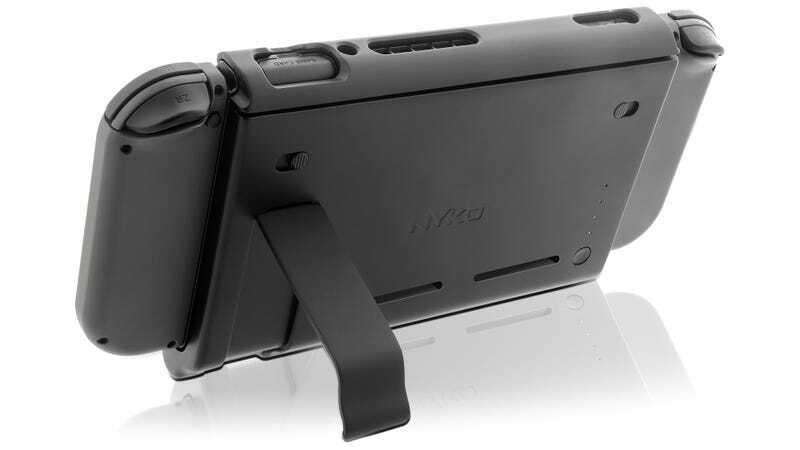 Nyko’s new Power Pack accessory, available next month, clips on to the back of the Switch and more than doubles its battery life with an additional 5,000 mAh of power that can also be charged over USB-C. But added power also means added weight. It looks like a classic Super Nintendo controller, making it ideal for replaying Super Mario World once Nintendo’s classic games service becomes available for the Switch. 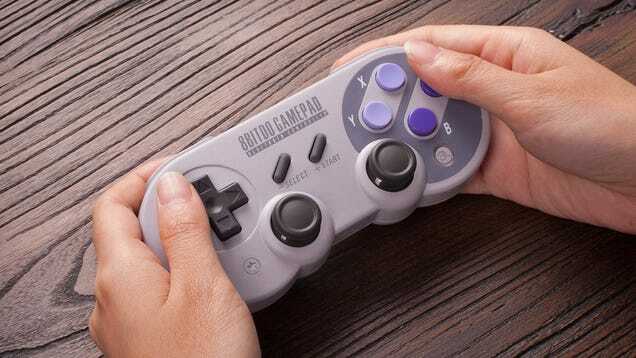 But 8Bitdo’s new SNES30 Pro adds dual analogue joysticks, extra shoulder buttons, rumble support, motion controls, USB-C charging, and Bluetooth, allowing you to also play Zelda: Breath of the Wild with it, or games on your PC, Mac, or Android mobile device. Ultra Street Fighter II: The Final Challengers is the first Nintendo Switch game that shows off the new console’s ability to play classic 2D titles. But those tiny Joy-Con controllers don’t do Street Fighter II justice. 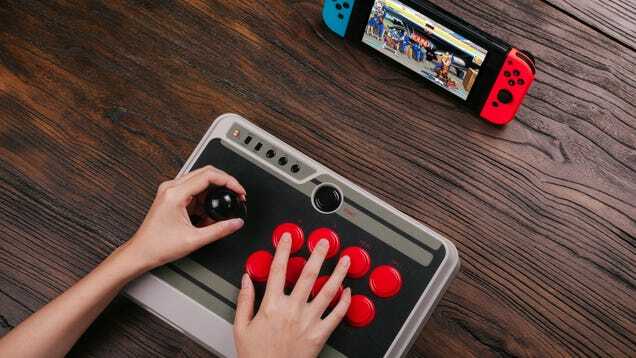 For the real arcade experience, 8Bitdo will also be releasing the NES30 Arcade Stick with Bluetooth, turbo functionality, and joystick vs. directional pad modes so you can customise your fighting style. Just be prepared to say goodbye to the Switch’s portability.